What Is A Smart Dust? Berkeley’s Smart Dust project, led by Professors Pister and Kahn, explores the limits on size and power consumption in autonomous sensor nodes. Size reduction is paramount, to make the nodes as inexpensive and easy-to-deploy as possible. The research team is confident that they can incorporate the requisite sensing, communication, and computing hardware, along with a power supply, in a volume no more than a few cubic millimeters, while still achieving impressive performance in terms of sensor functionality and communications capability. These millimeter-scale nodes are called “Smart Dust.” It is certainly within the realm of possibility that future prototypes of Smart Dust could be small enough to remain suspended in air, buoyed by air currents, sensing and communicating for hours or days on end. This remarkable package has the ability to sense and communicate and is self powered. A major challenge is to incorporate all these functions while maintaining very low power consumption. The Smart Dust mote is run by a microcontroller that not only determines the tasks performed by the mote, but controls power to the various components of the system to conserve energy. 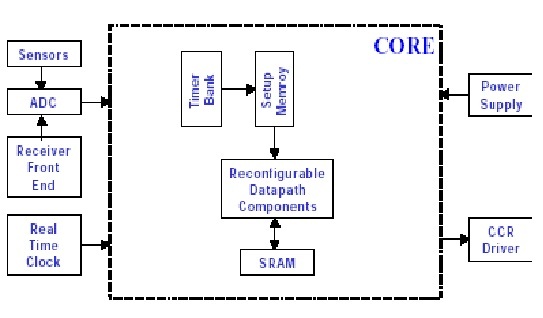 Periodically the microcontroller gets a reading from one of the sensors, which measure one of a number of physical or chemical stimuli such as temperature, ambient light, vibration, acceleration, or air pressure, processes the data, and stores it in memory. It also occasionally turns on the optical receiver to see if anyone is trying to communicate with it. This communication may include new programs or messages from other motes. In response to a message or upon its own initiative the microcontroller will use the corner cube retro reflector or laser to transmit sensor data or a message to a base station or another mote. The primary constraint in the design of the Smart Dust motes is volume, which in turn puts a severe constraint on energy since we do not have much room for batteries or large solar cells. Thus, the motes must operate efficiently and conserve energy whenever possible. Most of the time, the majority of the mote is powered off with only a clock and a few timers running. When a timer expires, it powers up a part of the mote to carry out a job, then powers off. A few of the timers control the sensors that measure one of a number of physical or chemical stimuli such as temperature, ambient light, vibration, acceleration, or air pressure. When one of these timers expires, it powers up the corresponding sensor, takes a sample, and converts it to a digital word. 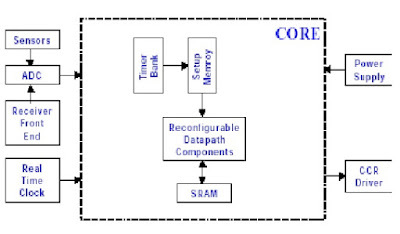 If the data is interesting, it may either be stored directly in the SRAM or the microcontroller is powered up to perform more complex operations with it. When this task is complete, everything is again powered down and the timer begins counting again. Smart Dust’s full potential can only be attained when the sensor nodes communicate with one another or with a central base station. Wireless communication facilitates simultaneous data collection from thousands of sensors. There are several options for communicating to and from a cubic-millimeter computer. Radio-frequency and optical communications each have their strengths and weaknesses. Radio-frequency communication is well under-stood, but currently requires minimum power levels in the multiple milliwatt range due to analog mixers, filters, and oscillators. If whisker-thin antennas of centimeter length can be accepted as a part of a dust mote, then reasonably efficient antennas can be made for radio-frequency communication. While the smallest complete radios are still on the order of a few hundred cubic millimeters, there is active work in the industry to produce cubic-millimeter radios. 1. Dust motes offer very limited space for antennas, thereby demanding extremely short wavelength (high frequency transmission). Communication in this regime is not currently compatible with low power operation of the smart dust. 2. Furthermore radio transceivers are relatively complex circuits making it difficult to reduce their power consumption to required microwatt levels. 3. They require modulation, band pass filtering and demodulation circuitry. These MEMS structure makes it possible for dust motes to use passive optical transmission techniques ie, to transmit modulated optical signals without supplying any optical power. It comprises of three mutually perpendicular mirrors of gold-coated polysilicon. The CCR has the property that any incident ray of light is reflected back to the source (provided that it is incident within a certain range of angles centered about the cube’s body diagonal).If one of the mirrors is misaligned , this retro reflection property is spoiled. The micro fabricated CCR contains an electrostatic actuator that can deflect one of the mirrors at kilohertz rate. It has been demonstrated that a CCR illuminated by an external light source can transmit back a modulated signal at kilobits per second. Since the dust mote itself does not emit light , passive transmitter consumes little power. Using a microfabricated CCR, data transmission at a bit rate upto 1 kilobit per second and upto a range of 150 mts ,using a 5 milliwattt illuminating laser is possible. It should be emphasized that CCR based passive optical links require an uninterrupted line of sight. The CCR based transmitter is highly directional. A CCR can transmit to the BTS only when the CCR body diagonal happens to point directly towards the BTS, within a few tens of degrees. A passive transmitter can be made more omnidirectional by employing several CCRs, oriented in different directions, at the expense of increased dust mote size. Choose the case of military base monitoring wherein on the order of a thousand Smart Dust motes are deployed outside a base by a micro air vehicle to monitor vehicle movement. The motes can be used to determine when vehicles were moving, what type of vehicle it was, and possibly how fast it was travelling. The motes may contain sensors for vibration, sound, light, IR, temperature, and magnetization. CCRs will be used for transmission, so communication will only be between a base station and the motes, not between motes. A typical operation for this scenario would be to acquire data, store it for a day or two, then upload the data after being interrogated with a laser. However, to really see what functionality the architecture needed to provide and how much reconfigurability would be necessary, an exhaustive list of the potential activities in this scenario was made. The operations that the mote must perform can be broken down into two categories: those that provoke an immediate action and those that reconfigure the mote to affect future behavior. Smart dust is made up of thousands of sand-grain-sized sensors that can measure ambient light and temperature. The sensors -- each one is called a "mote" -- have wireless communications devices attached to them, and if you put a bunch of them near each other, they'll network themselves automatically. Today, the interaction of human individuals with electronic devices demands specific user skills. In future, improved user interfaces can largely alleviate this problem and push the exploitation of microelectronics considerably. In this context the concept of smart clothes promises greater user-friendliness, user empowerment, and more efficient services support. Wearable electronics responds to the acting individual in a more or less invisible way. It serves individual needs and thus makes life much easier. We believe that today, the cost level of important microelectronic functions is sufficiently low and enabling key technologies are mature enough to exploit this vision to the benefit of society. In the following, we present various technology components to enable the integration of electronics into textiles. Advances in textile technology, computer engineering, and materials science are promoting a new breed of functional fabrics. Fashion designers are adding wires, circuits, and optical fibers to traditional textiles, creating garments that glow in the dark or keep the wearer warm. Meanwhile, electronics engineers are sewing conductive threads and sensors into body suits that map users' whereabouts and respond to environmental stimuli. Researchers agree that the development of genuinely interactive electronic textiles is technically possible, and that challenges in scaling up the handmade garments will eventually be overcome. Now they must determine how best to use the technology. Electronic textiles (e-textiles) are fabrics that have electronics and interconnections woven into them. Components and interconnections are a part of the fabric and thus are much less visible and, more importantly, not susceptible to becoming tangled together or snagged by the surroundings. Consequently, e-textiles can be worn in everyday situations where currently available wearable computers would hinder the user. E-textiles also have greater flexibility in adapting to changes in the computational and sensing requirements of an application. The number and location of sensor and processing elements can be dynamically tailored to the current needs of the user and application, rather than being fixed at design time. As the number of pocket electronic products (mobile phone, palm-top computer, personal hi-fi, etc.) is increasing, it makes sense to focus on wearable electronics, and start integrating today's products into our clothes. The merging of advanced electronics and special textiles has already begun. Wearable computers can now merge seamlessly into ordinary clothing. Using various conductive textiles, data and power distribution as well as sensing circuitry can be incorporated directly into wash-and-wear clothing. Whatever the technical obstacles, researchers involved in the development of interactive electronic clothing appear universally confident that context-aware coats and sensory shirts are only a matter of time. Susan Zevin, acting director of the Information Technology Laboratory at the US National Institute of Standards and Technology (NIST), would like to see finished garments fitted with some form of data encryption system before they reach consumers. After all, wearing a jacket that is monitoring your every movement, recording details about your personal well-being, or pinpointing your exact location at a moment in time, adds a whole new dimension to issues of wireless security and personal privacy. "The challenge, I think, for industry is to build in the security and privacy before the technology is deployed, so the user doesn't have to worry about having his or her T-shirt attacked by a hacker, for example," says Zevin. "People don't want to have to upload and download intrusion detection systems themselves. Pervasive computing should also mean pervasive computer security, and it should also mean pervasive standards and protocols for privacy." She notes that the level of security required for electronic textile garments will vary according to their applications. In this program for the US Army, Foster-Miller integrated data and communications antennas into a soldier uniform, maintaining full antenna performance, together with the same ergonomic functionality and weight of an existing uniform. We determined that a loop-type antenna would be the best choice for clothing integration without interfering in or losing function during operations, and then chose suitable body placement for antennas. With Foster-Miller's extensive experience in electro-textile fabrication, we built embedded antenna prototypes and evaluated loop antenna designs. The program established feasibility of the concept and revealed specific loop antenna design tradeoffs necessary for field implementation. This program provided one of the key foundations for Foster-Miller's participation in the Objective Force Warrior program, aimed at developing soldier ensemble of the future, which will monitor individual health, transmit and receive mission-critical information, protect against numerous weapons, all while being robust and comfortable. Limitations and Issues of the "Smart Shirt"
Some of the wireless technology needed to support the monitoring capabilities of the "Smart Shirt" is not completely reliable. The "Smart Shirt" system uses Bluetooth and WLAN. Both of these technologies are in their formative stages and it will take some time before they become dependable and widespread. Additionally, the technology seems to hold the greatest promise for medical monitoring. However, the "Smart Shirt" at this stage of development only detects and alerts medical professionals of irregularities in patients' vital statistics or emergency situations. It does not yet respond to dangerous health conditions. Therefore, it will not be helpful to patients if they do face complications after surgery and they are far away from medical care, since the technology cannot yet fix or address these problems independently, without the presence of a physician. Future research in this area of responsiveness is ongoing. Designing with unusual materials can create new user attitudes towards computing devices. Fabric has many physical properties that make it an unexpected physical, interface for technology. It feels soft to the touch, and is made to be worn against the body in the most intimate of ways. Materially, it is both strong and flexible, allowing it to create malleable and durable sensing devices. Constructing computers and computational devices from fabric also suggests new forms for existing computer peripherals, like keyboards, and new types of computing devices, like jackets and hats. 3D printing is a form of additive manufacturing technology where a three dimensional object is created by laying down successive layers of material. It is also known as rapid prototyping, is a mechanized method whereby 3D objects are quickly made on a reasonably sized machine connected to a computer containing blueprints for the object. Stereo lithographic 3D printers (known as SLAs or stereo lithography apparatus) position a perforated platform just below the surface of a vat of liquid photo curable polymer. A UV laser beam then traces the first slice of an object on the surface of this liquid, causing a very thin layer of photopolymer to harden. The perforated platform is then lowered very slightly and another slice is traced out and hardened by the laser. Another slice is then created, and then another, until a complete object has been printed and can be removed from the vat of photopolymer, drained of excess liquid, and cured. It creates the model one layer at a time by spreading a layer of powder and inkjet printing binder in the cross-section of the part. It is the most widely used 3-D Printing technology these days and the reasons beyond that are stated below. 1) Allows for the printing of full color prototypes. 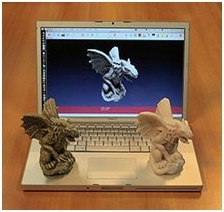 2) Unlike stereo lithography, inkjet 3D printing is optimized for speed, low cost, and ease-of-use. 3) No toxic chemicals like those used in stereo lithography are required. 4) Minimal post printing finish work is needed; one needs only to use the printer itself to blow off surrounding powder after the printing process. 5) Allows overhangs and excess powder can be easily removed with an air blower. 1) Automatic air filter: ensures that all powder stays within the confines of the machine, emitting only clean air into the office or workroom environment. 2) Binder cartridge: contains the water-based adhesive that solidifies the powder. 3) Build chamber: the area where the part is produced. 4) Carriage: slides along the gantry to position the print heads. 5) Compressor: generates compressed air to depowder finished parts. Our vision of making on-demand prototyping accessible to everyone requires that printing a model be almost as easy as printing a document. We envisioned that every designer, engineer, intern or student should be able to ZPrint a prototype. And like a document printer, a 3D printer should be perfectly compatible with a professional office environment. To achieve these goals, the ZPrinter automates operation at nearly every step. This includes setup, powder loading, self-monitoring of materials and print status, printing, and removal and recycling of loose powder. The ZPrinter is quiet, produces zero liquid waste and employs negative pressure in a closed-loop system to contain airborne particles. Powder and binder cartridges ensure clean loading of build materials. Plus, an integrated fine-powder removal chamber reduces the footprint of the system. All of these advances mean that no special training is required, and the “hands on” time for operating the 3D printer is just a few minutes. You control the ZPrinter from either the desktop or the printer. ZPrint software lets you monitor powder, binder, and ink levels from your desktop, and remotely read the machine’s LCD display. The on-board printer display and intuitive interface enables you to perform most operations at the machine. Plus, the ZPrinter runs unattended during the printing process, requiring user interaction only for setup and part removal. Rapidly produce 3D models to reduce operating time, enhance patient and physician communications, and improve patient outcomes.